The city of Arequipa is located in the South part of Peru and flanked by three snow-capped volcanoes: Misti (19098 ft – 5821 mt), Chachani (19931 ft – 6075 m) and Picchu Picchu ()177999 ft – 5425 mt). It is one of the mort important capital in Peru after Lima and is well know as the “White city” as its buildings are made by sillar, a white volcanic rock. 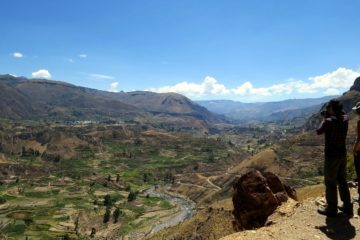 This rich part of Peru has been populated sin ancient times as evidenced by the incredible terracing in the Colca canyon. 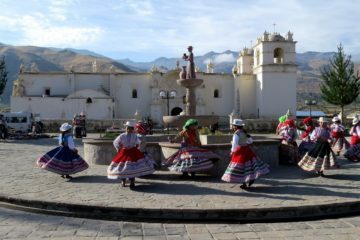 It you have some free time do not forget to include Colca in your travel plans. The Inca conquered the region and some years ago the archaeologist found at Ampato volcano an intact mummy of a young Inca woman sacrificed at least 500 years ago. This mummy is called “Juanita” and it can be visited while your stay in Arequipa. Arequipa tours has many things to offer as its particular gastronomy, colonial houses, Toro Muerto Petroglyphs, etc. Upon arrival in Arequipa, we are met and transferred to the hotel. Arequipa known as the “White City”, is located in southern Peru at an elevation of approximately 7,500 feet. 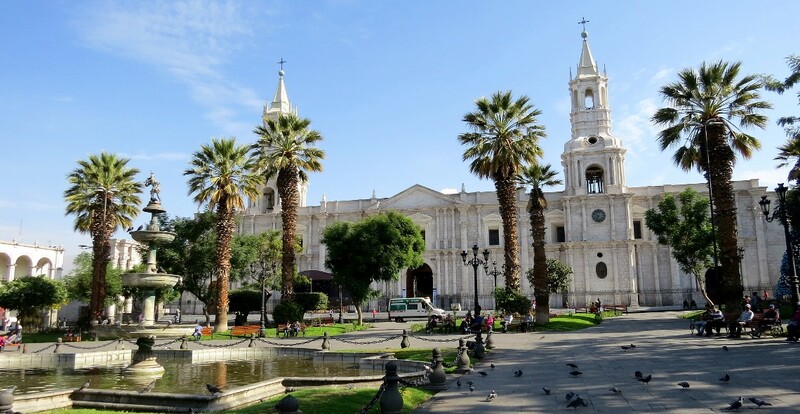 This afternoon we will take a guided excursion of city of Arequipa, visiting the Main Plaza, one of the beautiful in all Peru, the Cathedral, La Compañia, San Francisco church and Santa Catalina Convent built at the 16th century. It was completely closed to outside visitors for almost 400 years, this magnificent convent has been the scene of many historic and religious events and adventures. Its medieval streets, named for ancient Spanish cities, branch out into hidden lanes with cells of varying types and sizes. For centuries nuns lived their whole lives here isolated from the rest of the world. We return to Arequipa hotel. This morning we tour for the Inca terraces in Paucarpata and the Sabandia Mill, which has been in use since ancient colonial times. Follow the panoramic road to the “Fundador” Mansion and return to the city. 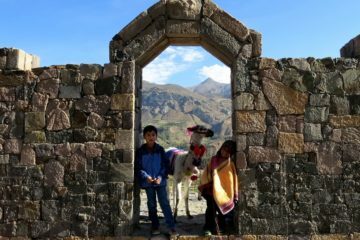 Afternoon at leisure to explore the city or visit the Museum where you will learn more about Juanita, the Inca mummy recently found in the surroundings of Arequipa. We transfer to the airport for our onward connection Cusco or Puno.